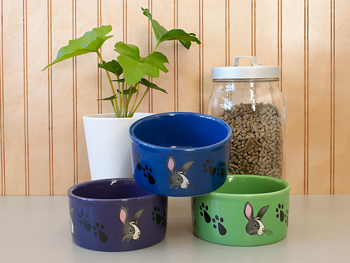 Bowls provide a more comfortable and natural drinking solution for rabbits. Bowl is heavy ceramic, safely glazed outside and inside with a variety of vibrant colors, decorated with a bunny and pawprints. It'll look beautiful in their home...which is in your home! Works perfectly for foods, as well as water or treats. Unfortunately, we cannot order specific colors from the manufacturer. If you make a request for a specific color we will do our best to make it happen, but we cannot guarantee it! Size: 4 1/2" diameter by 2" tall (outside dimensions). Holds about 1 1/3 cups.